Viewing PowerPoint files using an Android device has become easier than it was just a few years back. There are a number of easy methods that you can use to open a PowerPoint presentation on Android. We have listed a few of the most convenient methods below; which can enable you to seamlessly view and (in some cases) edit your PowerPoint presentations on Android devices. With the mobile first, cloud first strategy, Microsoft has been delivering Office Applications for the major mobile OS’s. 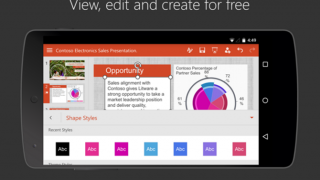 On 2015, it was launched the Microsoft PowerPoint for Android. This release of the popular presentation software provides a comprehensive set of functionalities to create, edit and deliver presentations on the go. For devices with Android versions below 4.4, Microsoft delivered the Microsoft Office Mobile which enables users to view presentations in their phones. Both products are free to download and use and require a Microsoft Account. There are a number of online platforms which enable viewing PowerPoint presentations for free. These include cloud services like Google Drive, Dropbox, Box and others. For the best experience we recommend using PowerPoint Online. This is a web app from the Office Online family which enables creating, viewing, editing and presenting your PowerPoint presentations from an Internet connected browser. 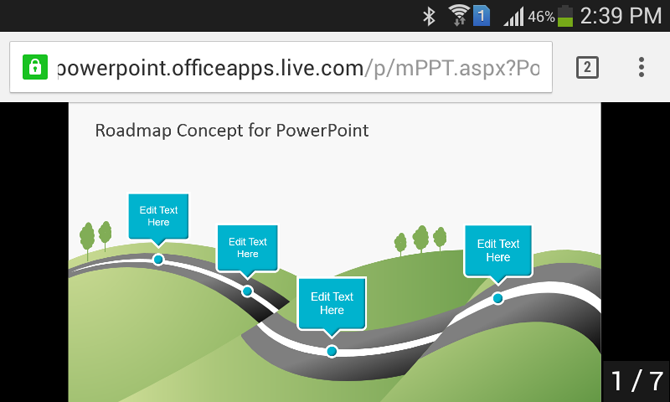 The below screenshot shows the Creative Roadmap Concept PowerPoint Template running via PowerPoint Online web app on an Android browser. 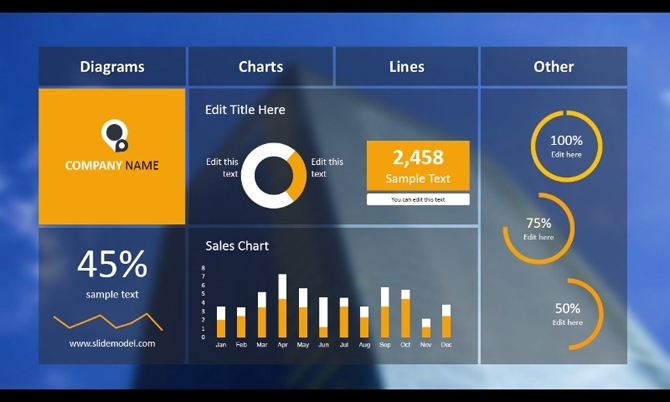 PowerPoint Online is the best suited presentation tool when you need to work with decks that make use of advanced PowerPoint features as 3D effects, gradients and animations as it preserves the experience generated with the Application version. Other than PowerPoint Online, you can use Google Drive powered Google Slides app. This web app can either be directly accessed via a browser or you can simply get the Google Slides for Android app to get support for PowerPoint files on your Android device. With Google Slides you can create and edit presentations on the go, as well as view existing PowerPoint files. 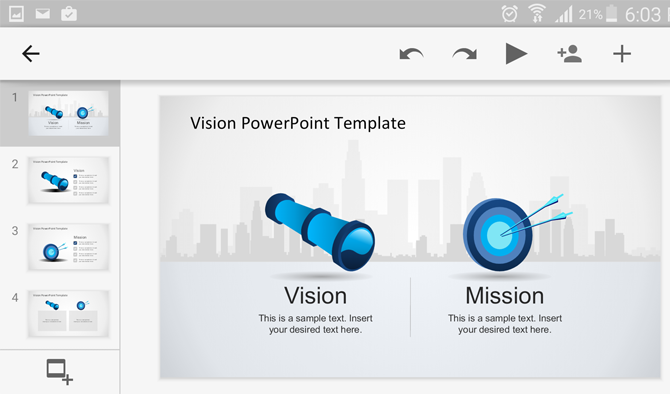 The below screenshot shows the Mission and Vision PowerPoint Template running on the Google Slides app for Android. SlideOnline is a web app which supports PowerPoint and PDF files for instant conversion into shareable online slides. You can upload your PowerPoint presentations to SlideOnline and view them via an Internet connected device with a browser; including Android devices. Files uploaded to SlideOnline can be viewed within an easy to navigate interface, where each slide can be seen using navigation buttons. You can also enable comments for user feedback for uploaded presentations. The uploaded files can be kept either public or private and you can share them online via direct link, social media buttons and embed code. 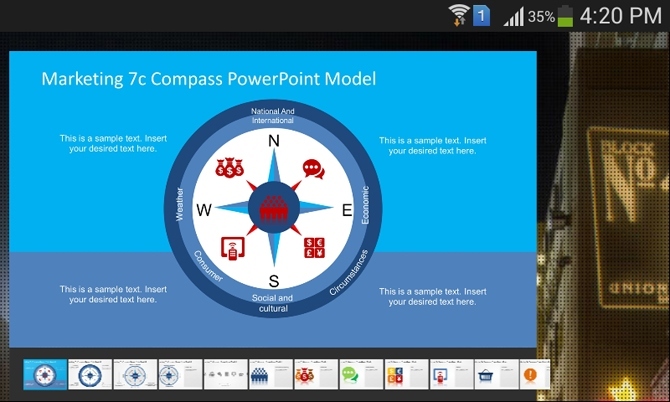 The below screenshot shows the Marketing 7C Compass PowerPoint Template uploaded to SlideOnline, running on an Android device via an internet browser. 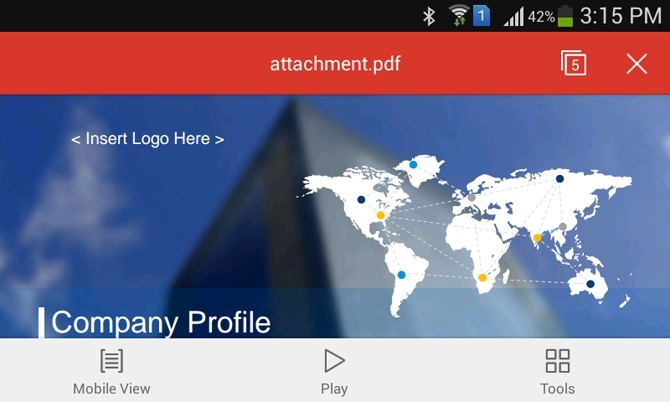 If you don’t intend to use PowerPoint apps for Android, you can simply save your PowerPoint files to PDF format and view them using a PDF supported Android app. If you have PowerPoint installed on your computer, you can save your PowerPoint presentation files to PDF format via File –> Save As –> PDF. Otherwise, you can use PowerPoint Online and print the PowerPoint presentation into PDF. To demonstrate the above mentioned functionality, we saved the Company Profile PowerPoint Template in PDF format and opened it using Android. You can also export your PowerPoint slides as individual pictures, save them to a single folder and save the folder to your Android device. This way you can play your slides as images one by one. You can save your PowerPoint in a preferred image format (e.g. JPG, BMP or GIF) via File –> Save As -> JPG / BMP / GIF from PowerPoint. We saved the Blue Dashboard PowerPoint Template in JPG format and opened the slides as images on Android. As you can see from the screenshot below, you can easily present your content as images on Android devices by converting your PowerPoint slides as JPG files. Another easy way of viewing your PowerPoint files on Android is to convert them to video format. PowerPoint 2013 supports conversion of PowerPoint slides to MP4 format, whereas older versions support conversion to WMV file format. To use the native video conversion function in PowerPoint, go to File –Save As –> MP4 or WMV. 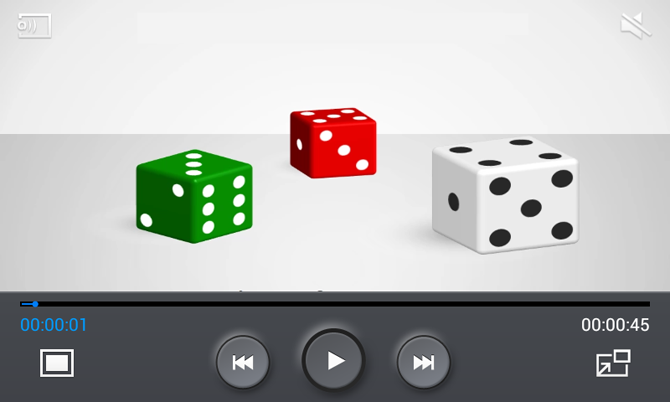 The below image shows the 3D Dice Shapes PowerPoint Template running as a video file on an Android device.